Yeah, I know. It’s about goddamn time I played “The last of us”, but I’ve been busy OK ? First of all, “Last of us” boasts ridiculously pretty graphics. Each and every frame is a cornucopia of crisp detail, high contrast colors, exquisitely composed level design, and all of it in glorious 1080p HD. I am playing the game on a 40′ TV-screen on my very new PS4. The graphics are pretty awesome. However, when the initial shock and awe subsides, the graphics are surprisingly marred by weird artefacts that I would, if I didn’t know better, call rookie mistakes: The level artists (well … some of them anyway) are overly fond of reflection cubemaps (or some similar technique, I can’t be sure), and have been sloppy in applying them. There are outdoors daylight scenes, where the ENTIRE ground is reflective like a highly polished mirror. Yes, also patches of dirt, even the floor under lean-tos impossibly reflects the sky.There are other issues like this, and honestly, it surprises me that a title which is so highprofile AAA have these kinds of glitches. Anyway. despite my rant above, the graphics are very, very awesome. The level and environment design is incredible as well. I’ll go out on a limb here and risk spoiling by saying out loud that “The last of us” takes place in a post apocalyptic version of USA :-). That world is explained and told to us through exquisite level and environment design. Many of the scenes that take place in the city, both before the apocalypse and way after, boasts very living backgrounds, where you get the feel that a lot of stuff is going on: Survivors chat with each other, some soldiers check some civilians, and finds one suspected of being infected. What follows tells us that justice and due process is long, long gone….Not subtle story telling, but it is very effective. The game and level design is very linear, but the the level designers have managed to make it feel like a very open world experience. You feel like you can at any time choose whatever direction to move in, although *that* path over there seems like its the most interesting direction to go, and sure enough: That path WILL be the next step of the path. The level designers hook their fingers firmly in your nostrils and pull you through the level, but you actually dont feel railroaded. Excellent nudging. The gameplay. Well. It’s AAA, so the gameplay is in fact extremely simple. well done of course, but really simple. As Joel, the games white-male, stubbled and troubled protagonist, you sneak past opponents, sneak up on them and take them down, either choking them, blowing their brains out or shivving them. It’s violent, ugly and brutal. I get the feeling that the brutality serves a purpose though: Joel is a man that has lost everything (as narrated in the brilliant opening sequence of the game). 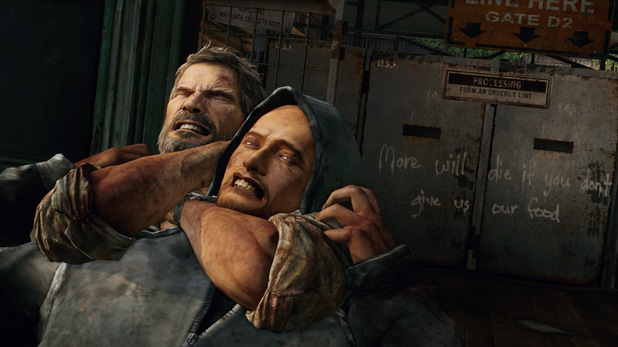 One of the things that got lost along the way, was his humanity, and this is well shown through the over-the-top brutality of the gameplay: Joel used to be a good solid salt-of-the-earth type of guy, but now he is a goon. It’s not subtle, but it works. Joel can pick up bottles, bricks and probably also other stuff to throw to misdirect and distract enemies. He can craft first aid kits, shivs, molotov cocktails and probably other stuff as well. The enemies of the game include evil soldiers, mad-max style postapocalyptic survivors and the mysterious, and quite possibly framed-as-terrorists-but-really-they-are-the-good-guys terrorists/freedomfighters the fireflies. And then there are the infected. I haven’t met too many of them yet, but the ones I HAVE met are genuinely scary, disturbing and horrible. The storyline is good so far. As I mentioned, I’m not that far in yet: about an hour of gameplay, ish. Joel is introduced in a great opening scene, that established him as a man that has lost everything, when, 20 years later, we find him again. Here, He is a man that lives by quick brutality and by taking care of himself and people very close to himself first and foremost. Joel and his tough-as-nails companion Tess is tasked with protecting a young girl, Ellie, and bring her to the Capitol building. This involves travelling through the unregulated wilderness part of the city, where the infected roam freely. Ellie might carry the key to the infection, but more importantly of course, she acts as Joels lifeline back to his own humanity, reminding him what it was like to be what he was, before he lost it all. I’m sure Naughty Dog will heap “the feels” all over the relationship between Ellie and Joel, and I’m looking forward to it. So. what is my verdict ? Well… to be honest, I don’t have one yet, but overall “The last of us” looks extremely promising, and I can’t wait to play some more.